Well, not actually donkeys of-course since I am not familiar with actual donkeys playing poker, but I do know poker players who think they know how to play poker but actually they are real donkeys around the table. Confused? A donkey is a term describing a player that has no true understanding of the game. He will not throw away his measly pair when the board shows two over cards to his pair or a possible straight or flush. You may think this is great since you can win a lot of money from this situation but that is not always the case. As a poker player, you should play mixed poker. You should always mix your game and confuse your opponent, not allowing him to put you on a hand, but the problem with a donkey player is that he will not understand your bluffs, he will not try to put you on a hand, he will play his hand and that is it. Where can it back fire you? Let's say you missed the flop and the board shows A-7-10. You bet trying to represent an ace and your opponent calls. The turn comes out K and you keep on with a larger bet on to get called by your opponent. The river comes out 8, whether you bet or check your opponent will bet or call you and at the showdown you'll see he holds 8-10 which means he caught two pair on the river. This is just one example how a donkey plays. Once he hit the board, he will not throw away his hand most likely, he will not try to guess your hand, he will not understand what you're trying to represent or what pot odds are. So, whether playing poker around live tables or at poker sites, what is the right way to play against a player who does not understand the game and what you're trying to represent? 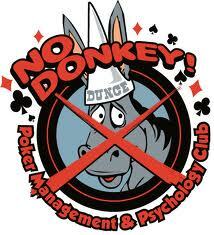 •	Play tight – Against a donkey player you should play tight aggressive poker. If you hit the board, bet and be aggressive putting the pressure on your opponent. •	Stay cool – Losing to these kinds of players can be very frustrating. You play your best poker, make some awesome moves and your opponent does not throw his hand only to win on the river with a weak hand. Stay cool and calm and don't get on tilt. •	Don't even try to read them – You just won't succeed. They can bet and call with a pair of 3 when the board shows ace and king. They play horrible poker and can play with any range of hand, only they don't play it right, so just play tight with your hand and don't try to bluff. This may be strange to comprehend, but it's easier to play poker against a pro and a player who understand poker, bluffs and what you're representing than a player who does not throw away his hand no matter what just to catch his two pair or three of a kind on the river.